Get Social in Real World Again with CYBntity's New Social Platform "GoodTime"
AUSTIN, Texas, March 11, 2019 /PRNewswire/ -- CYBntity LLC. is launching its new social platform "GoodTime" for iOS and Android devices on March 11, 2019 at SXSW Startup Spotlight. The AI-powered social platform works as a perfect assistant for consumers and businesses to plan and organize real world get-togethers based on match-making of interests and preferences of people within their network and not with a mesh of dispersed random connections. Socialization is a big part of life. People want to spend meaningful time with people they care about doing things they love and expecting good moments every minute. Businesses want to ensure longevity, agility and profitability by engaging their existing and potential customers in more meaningful, personalized and relevant ways than ever. The underlying structural factor, however, is the deep-seated need to connect with others in a fulfilling way and the attempts to satisfy it. Social media, nevertheless, provided some underpinning for the main thrust of this fulfilment. Swiftly adopted as a break-through solution for all socializing needs, social media helped people stay more informed about each other. However, research studies oft stated that social media interactions cause more mental and emotional challenges than providing the social support needed, thus turning us into a lonelier society. This is not to say that social media is a problem, but how people behavior is altered through screen-time over-indulgence, and how meaningful social interactions are getting replaced by shallow virtual nudges. When this happens, the real question is not "If we're connected to thousands of people and are keeping them informed?" but "Does staying informed compensate for real in-person social interaction?" The GoodTime application is an effort to encourage and turn the virtual, individualistic social interactions into collectivistic real-world social experiences. Its main task is to relieve decision fatigue associated with organizing a get-together using a single application to handle multiple tasks. User data protection is its another key strength. The application matches user's preferences, interests and hobbies; analyses users' traits — that they stream rock music, attend bokwa classes, make dinner reservations at steakhouses, buy tickets to soccer and much more. Then it scans a matrix of hundreds of activities to find matches, filtering a recommendation perfectly aligned with their interests in real time. So, rather than seeing a random advertisement that tries to appeal to everyone, the users get custom recommendations just for them with perks designed just for them. The geo-targeting filter ensures the recommendations shown were within driving distance of the user's home. Viewers could then explore the recommendations on each activity on GoodTime website. So, they could plan their real get-togethers and share it with others. The GoodTime platform anticipates a user base of over 300 million consumers and one million business get-togethers. The application is available to consumers at no cost. For businesses, it has a small subscription-based service model to cover the cost of managing and operating this platform. In return, this helps businesses attract the best fit using AI powered matching system. The existing capabilities of GoodTime platform are just a starting point and as it gets mature with market adoption and usage, the iterations are plentiful. Explore more about the GoodTime platform at SXSW 2019. Visit Austin Convention Center Hall 1, booth #2112 on March 11th 2019. Join the GoodTime revolution on Twitter (@theGoodTimeApp), Facebook (The-Good-Time-App) and Instagram (@thegoodtimeapp). 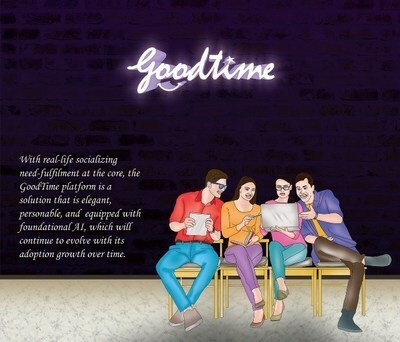 GoodTime is an AI powered platform created with a vision to value interpersonal interactions and enable people to create social events effectively, making the fatiguing task of planning and executing any get-together a "no big deal". The company behind GoodTime believes that human-centred technologies can make human connect meaningful, livelier and that intelligently crafted solutions do solve small complex problems. Learn more about The GoodTime Platform here.